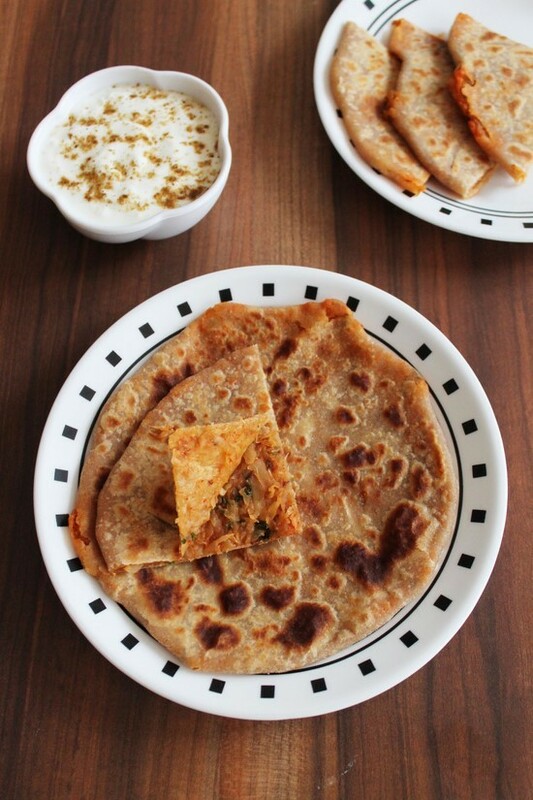 Mooli Paratha recipe – a stuffed parantha recipe from land of Punjab. The stuffing is made from spicy, cooked grated mooli aka radish. I have sautéed the grated mooli with some spices for stuffing. But I remember, my mom makes mooli paratha recipe without cooking it. She first squeeze all the water then mix few spices like chili powder, chaat masala, garam masala, chopped chilies and coriander leaves. her stuffing mixture is ready. You can try it this way too. either way it tastes fabulous. If you have radish leaves then chop up and use in the recipe. 1) Take grated mooli into a bowl. Sprinkle some salt and let it rest for 15 minutes. 2) After 15 minutes, squeeze out all the water. 3) Heat the oil in a pan on medium heat. Once hot add ajwain and cumin seeds. Let them sizzle a bit. 4) Then add chopped green chilies, ginger paste and mooli. Mix well. 5) Add dry spice powders (red chili powder, garam masala and amchur powder), mix. 6) Cook till mixture becomes dry. Make sure that, it does not have any moisture in it. Remove it to a plate and let it cool completely. 7) White stuffing is cooling, take flour, salt and oil in a bowl. Mix well using your fingers so oil is incorporated well. 8) Start kneading the dough by adding little water a time. 9) Knead into smooth dough, cover it and let it rest for 15 minutes. 10) By this time mixture is cooled. divide the mixture into 6 equal portions. Divide the dough into six equal portions, make smooth balls and flatten them between your plams. 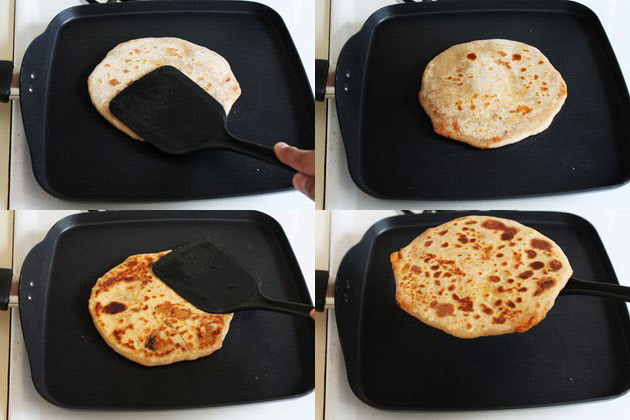 11)Before you start rolling, heat the tawa on medium heat for frying the parathas. Take one flatten ball at a time, dust it into dry flour and start rolling. 12) Roll into 4 inch diameter circle; keep the edges thinner than center. 13) Place 1 portion of mooli stuffing in the center. Gather the edges and pinch it into the center. 14) Seal it tightly and flatten it by pressing very gently. 15) Again dust it into dry flour and roll it very gently and carefully into about 6 inch diameter circle. 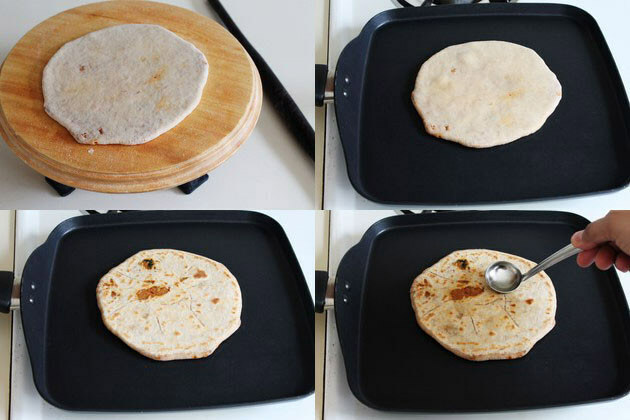 Keep in mind that rolling stuffed paratha to perfection comes via practice. 16) Now place it on to hot tawa and cook. 17) After few seconds you may notice few bubbles on top, that time flip it. It should have few brown spot. Cook on other side as well. 18) Apply some oil on it and then flip it. 19) Lightly press it with spatula and fry till there is no doughy part and it has golden brown, crispy spots. 20) Apple some oil on this side and flip it again. 21) fry other side same way by pressing with spatula. It might get puffed a little bit if rolled properly. 22) Once cooked from both sides, remove it to a serving plate. 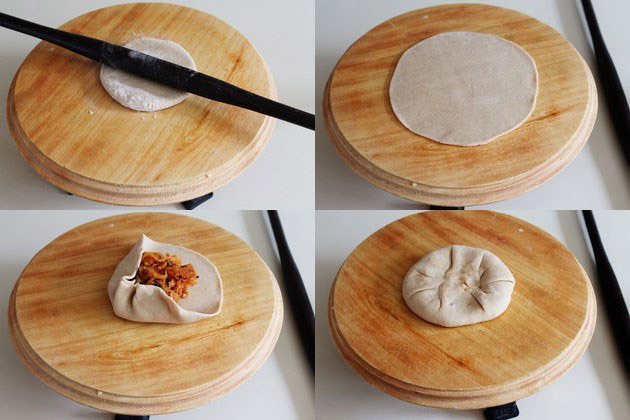 Repeat the same rolling and frying process for rest of the parathas. Keep cooked mooli paratha into insulated container to keep it warm. Serving suggestion: Serve them with plain yogurt or raita (onion tomato raita, palak raita, tadka raita) or pickle as a light meal or breakfast. I prefer to make this as a dinner. I have served it with homemade yogurt sprinkled with roasted cumin powder. Grate the mooli and measure it to 4 cups. Take that into a bowl. Sprinkle some salt and let it rest for 15 minutes. After 15 minutes, squeeze out all the water. Heat the oil in a pan on medium heat. Once hot add ajwain and cumin seeds. Let them sizzle a bit. Then add chopped green chilies, ginger paste and mooli. Mix well. Add dry spice powders (red chili powder, garam masala and amchur powder), mix. 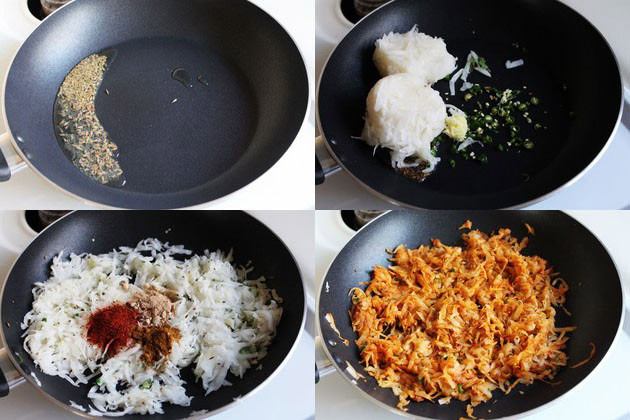 Cook till mixture becomes dry. Make sure that, it does not have any moisture in it. Remove it to a plate and let it cool completely. White stuffing is cooling, take flour, salt and oil in a bowl. Mix well using your fingers so oil is incorporated well. 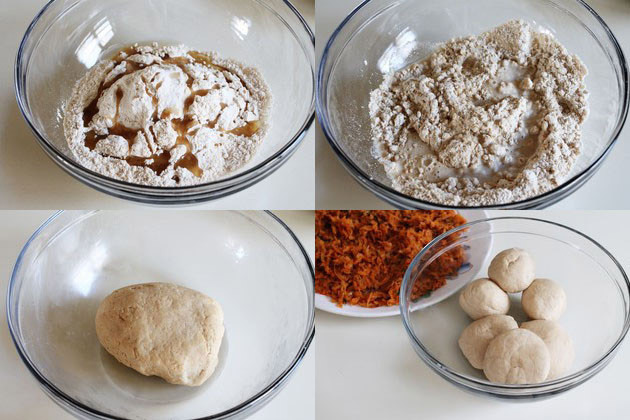 Start kneading the dough by adding little water a time. Knead into smooth dough, cover it and let it rest for 15 minutes. Now stuffing mixture is cooled. divide the mixture into 6 equal portions. Make smooth balls and flatten them between your plams. Before you start rolling, heat the tawa on medium heat for frying the parathas. Take one flatten ball at a time, dust it into dry flour and start rolling. Roll into 4 inch diameter circle. Place 1 portion of mooli stuffing in the center. Gather the edges and pinch it into the center. Seal it tightly and flatten it by pressing very gently. Again dust it into dry flour and roll it very gently and carefully into about 6 inch diameter circle. Now place it on to hot tawa and fry both sides using little amount of oil. Repeat the same rolling and frying process for rest of the parathas. Keep cooked paratha into insulated container to keep it warm. A very well written and equally well illustrated recipe. Easy to understand and follow. 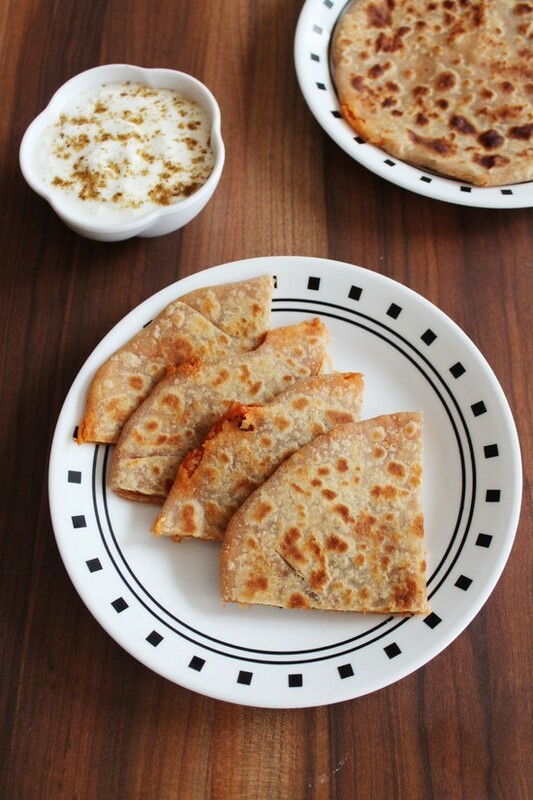 My USA raised and educated daughter made some delicious Parathas following this recipe. Many thanks for your recipe. Glad to hear that she made paratha and came out good. 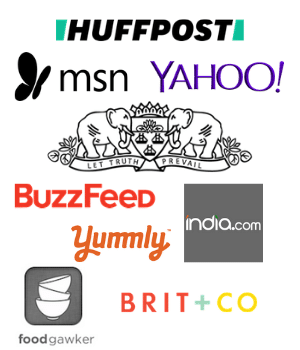 Thanks for the positive review. Nice to hear that you liked mooli paratha. Thanks for the feedback.